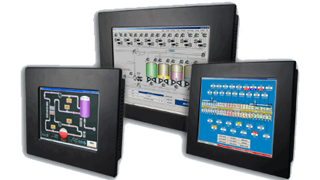 We offer a range of hardware & software products that allow you to build SCADA HMI applications for industrial and building automation. All products are high quality, reliable and easy to integrate with each other; SCADA software is easy to use and cost effective. Our offer is directed towards solution providers, system integrators, electrical installers, plant managers, operators of public utility networks. Our stand-out feature and strength lie in the ability to offer, in addition to the products, a prompt, accurate and thorough technical support. 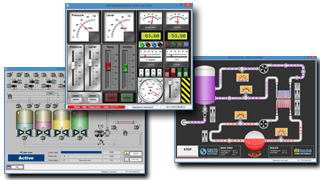 An easy to use, flexible and convenient software package for the development of SCADA HMI applications with a Web Server support (Web SCADA). 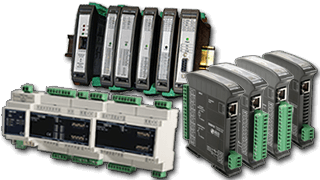 It includes an extensive driver library (OPC, Siemens, Omron, Allen Bradley, Modbus, etc.) and graphical libraries with thousands of static symbols and animated objects for industrial automation. A range of fanless Panel PCs equipped with Windows 7 Embedded. We can supply, at a highly competitive price, a PClog PC bundled with both Winlog Pro software development and runtime licenses, thus offering a powerful and flexible Panel PC SCADA system for the price of an Operator Panel. A range of I/O modules and isolated serial converters available in three different versions. By linking one or more I/O modules to a PC running Winlog Pro SCADA software, you can build a modular, reliable and convenient Data Acquisition System. The IoT gateway SS10680 allows you to directly interface the field instrumentation with the Cloud platform. Winlog Pro SCADA and Winlog Lite SCADA 3.02.19 have been released! Winlog Pro SCADA and Winlog Lite SCADA 3.02.18 have been released! Winlog Pro SCADA and Winlog Lite SCADA 3.02.17 have been released!